Langkawi Eatery is a relatively new place in downtown Kuah. This pork-free restaurant is directly opposite of the popular Wan Thai Langkawi Restaurant. 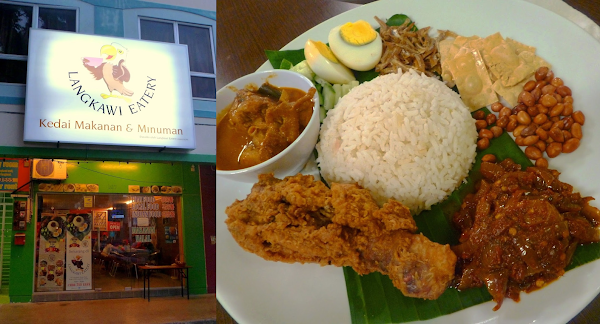 I am attracted by Langkawi Eatery's claim that it serves 5-star nasi lemak. If this is not attractive enough, I am not sure what is. At the bare minimum, Nasi Lemak (RM10.00) is a dish of rice and sambal belacan (spicy shrimp paste) wrapped in banana leaf. However to justify the "5-star" claim, the restaurant also includes chicken, fried anchovies, roasted peanuts, hard-boiled egg, cucumber and crackers. Rice is cooked using coconut milk to give it an aromatic appeal. I also like the way sambal belacan is prepared - moderate spiciness with loads of onion. As for poultry, there is a bowl of chicken curry and a piece of fried chicken. Coconut (RM8.00) is an excellent remedy to combat thirst and fatigue after a long day of adventure. Only the young coconut can be used as a drink. Its clear liquid has a cooling effect on the body. In addition, the flesh of young coconut can be eaten too. Ask the staff to widen the opening so that it is easier to scrape the flesh inside. Langkawi Eatery also serves Malay, Indian and Thai dishes. I wouldn't go so far as to say that its food is on par with those served at 5-star hotels. But at the very least, Langkawi Eatery's food quality is reasonable compared to its pricing. According to the friendly staff, Langkawi Eatery also operates a budget hotel on the upper floor.